Hitting fungo to your fielders is not the easiest thing to do… even for the seasoned coaches. Throwing a ball up to yourself and hitting it with a long, skinny fungo bat makes it very tough to accurately place fly balls, line drives, and ground balls where you intend. There’s almost an art to hitting fungo accurately. And we’re not all Picasso’s. So ask yourself this: When you hit balls to the kids at practice, do they spend more time catching the ball or running to balls that are out of reach? If you answered with the latter, consider making it a little easier on yourself and your players by getting an Accubat. The AME Innovations Accubat comes in two models: the Coaches Helper Model and the Pro Model. Both models are constructed with the same materials – a cushioned, non-slip, foam handle, a hard plastic outer racquet, and a polypropylene net bound by 30 rubber torsion bands. The netted hitting surface is relatively the same area on both models (90 in2). The only difference is that the Pro Model is 6 ounces heavier than the Coaches Helper (26 oz. vs 20 oz.). The advantage of the Pro Model is that it allows you to hit the ball harder and further than the Coaches Helper. 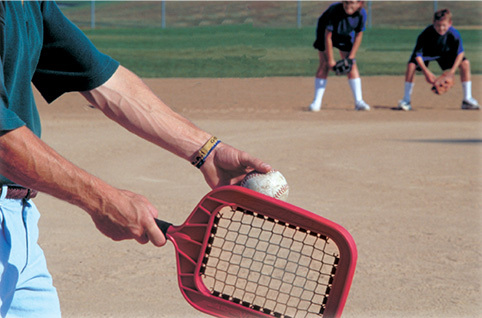 The Accubat is recommended for coaches and parents of baseball and softball players at all ages. It’s scientifically designed to give you placement and distance control unparalleled by any other fungo hitting device. The Coaches Helper Model is recommended for players under the age of 12. However, ball players over the age of 12 may need that extra oomph. The Pro Model is recommended for the older players who can handle the faster pace. As a highly competitive high school, travel ball, and college pitcher, I understood the importance of giving my fielders as many reps as I could. I was never the pitcher whose sole focus was striking people out. I pitched to contact and let the fielders behind me do their job. That said, I always did what I could to improve my defense’s fielding skills. Any chance I got to give my fielders some fungo work, I took advantage of. All serious pitchers (and ball players in general) should have that same mindset because there’s no worse feeling than being stranded in the field error after error when you should be in the dugout getting ready to hit. Baseball is a repetition sport. Infield and outfield fungo reps are crucial to building and maintaining defensive skills. 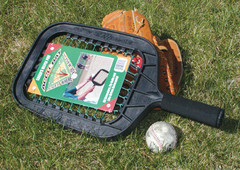 The Accubat has truly revolutionized the manner in which baseball and softball fungo can be done. 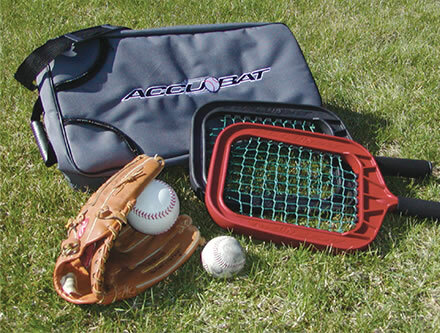 Coaches who want to make their practices more efficient and parents who want to give their kids some extra reps in the back yard should seriously consider purchasing an Accubat. 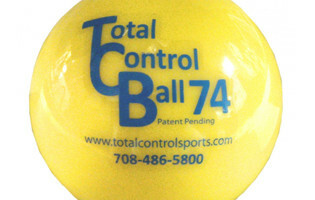 Pros: Very accurate, Easy and fun to use, Offers more control than a fungo bat, Very durable. Cons: Can be considered a rookie tool to high level competitors because of some notion that it steers away from how fungo has traditionally been and should be done. But c’mon… really? Form < Function.